"The New Adventures of Psionic Lad - Part Two"
Superboy is out for the count, Lori at his side while Psionic Lad tries to fight off the attackers from his own time. The three travelers are Science Hunters sent through time by the Master Hunter to retrieve the boy. In the nick of time Superboy awakens and intervenes, though the Science Hunters are quick to download a kryptonite armor update to counteract Conner. It may be a stalemate of power but something scares the trio of Science Hunters - Simon Valentine! The kids are unaware of why but are grateful and Psionic Lad theorizes the reason Lori was immune to the psychic backlash of his time travel was the high latent psychic potential that is locked inside her. He offers to stay in their time to help her train her abilities as long as Superboy can help him. Conner agrees, taking Simon and Psionic Lad to a field so they can explore Psionic Lad's origins. He is Sujan, from 2216, Acropolis, what was once Smallville. The villains that chased him are a splinter group of what was and will be the Science Police. Nobody knows Prime Hunter's true identity but he was a villain that had plagued Earth and its heroes for decades. This despot had enslaved Acropolis and only a band of heroes, of which he was one of, stood up to Prime and his Science Squads. When these inexperienced heroes were killed in battle only he survived and turned to Superboy, one of the greatest heroes of our generation to mentor him. Superboy questions his motives and asks why Psionic Lad doesn't just return to his time with the Teen Titans and Justice League to overthrow Prime Hunter. The boy refuses pointing out he wants to learn so they can save themselves. Conner is still unsure but Ma Kent arrives and offers Sujan a place to live while he learns from Conner. Psionic Lad offers thanks and Simon interrupts with a way that he can repay the Kents. That debt is repaid with a visit to Mr. Gilliam. Simon doesn't take too kindly to Sujan taking his place but even he is taken aback as Psionic Lad pieces parts of Mr. Gilliam's memories from within his coma. He sees the thin men, he sees the attack on himself and some strange screeching beasts before he hears a snippet of a plot to use him as bait to lure Superboy. The memories begin fading as he slips back into a coma. Sujan says with his limited abilities it's the best he could extract, for now. Later at the Kent farm they all discuss the 'broken silo' and the strange carved rune but realize they've hit a dead end. Simon heads home to feed the Parasite frogs and Sujan settles into his new room. Conner however pays his half-cousin a visit. 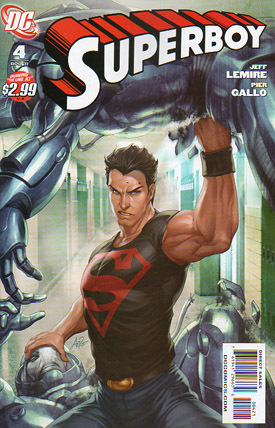 Lori offloads her anger at Superboy, given their history, she is hurt that he continually shuts her out. Just because she's a Luthor doesn't mean she's all bad. Conner agrees but admits he was having feelings for her but that it would be incestuous to pursue anything. He also reveals he and Cassie are on extremely shaky ground, he's feeling really overwhelmed by emotions and that he and Lori should keep their distance, saddened she agrees. Back on the Kent farm, Sujan conjures up a connection to one of his old teammates who should be dead. She asks Psionic Lad for a report on his mission and he reveals that his elaborate plan has worked and that he has infiltrated the trio of friends and when the time is right, he will kill his target. Story - 5: An issue that I'd hoped would have some story threads resolved only succeeded in revealing even more! The Science Hunters are obviously afraid of Simon, but to what end? 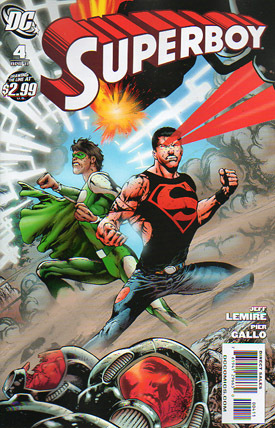 Is Sujan aiming to kill Superboy or Simon? Is Lori a kryptofreak? So many questions that add so much to an already fantastic book! Art - 5: Pier Gallo does it again. The soft art approach suits all the brilliant character moments without over complicating facial expressions and scenery. The flashbacks are genuinely spooky and the action loses nothing in translation. Cover Art - 2: How old is Conner, how old is Sujan? Why is Cyclops of the X-Men hijacking the cover? Barrow's cover just seems to go against everything inside the book. Surely a little research into the stylistics of the title or looking at the character models set up last month would help? Cover Art (Variant Cover) - 5: I hate variants, it just seems greedy, this time however I can make an exception! Not sure why this is the random variant, it's clearly the stronger of the two in my opinion. Stanley Lau has hit a home run here.